Every now and then a photographer takes an image that helps define them in their profession. Sometimes it is years down the path of their career. For me it happened relatively early as I was diving into my underwater photography journey. 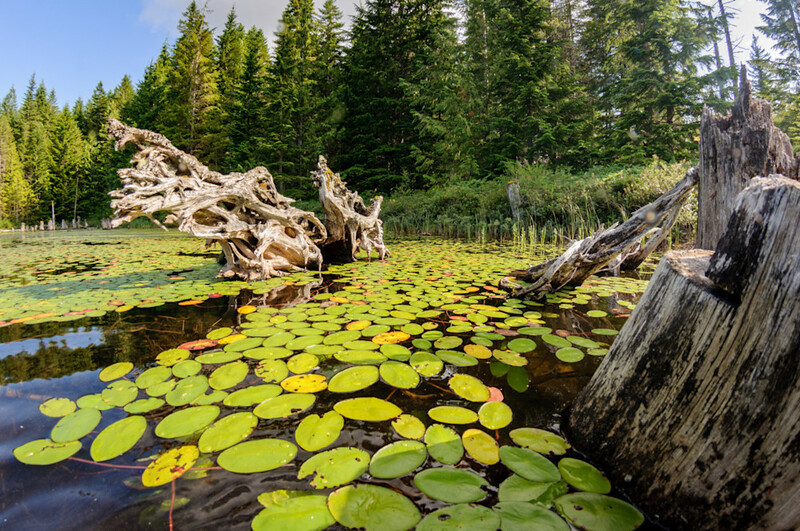 In the summer of 2012 I had only been shooting underwater for a few months and had been exploring the local swamps and rivers around Campbell River, as well as the ocean. On the memorable day of July 28th, I was “diving” in the swamp margin of Cedar Lake just north of Campbell River. 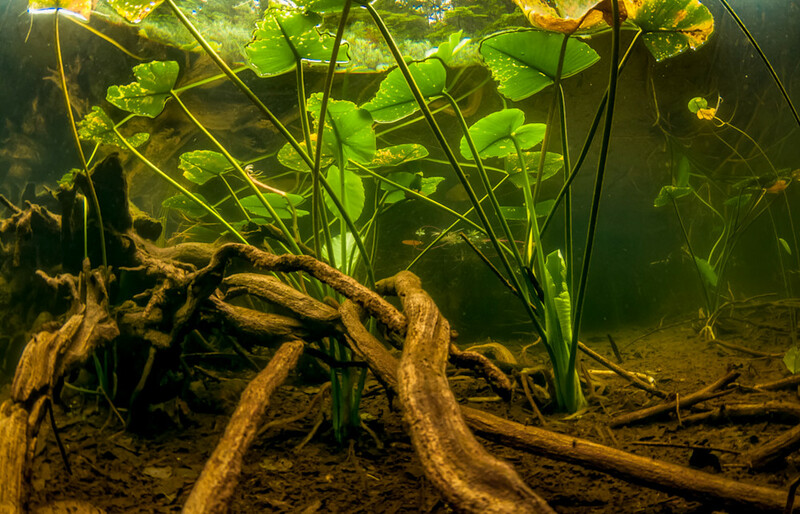 This one-two meter deep area of the lake is filled with Yellow Water Lily and Water-shield plants, as well as lots of logs and tree trunks. For an hour or so I was swimming around happily shooting abstract images of the reflections of the lily leaves in the underneath surface of the water. Not many people I know have ever thought to go swamp diving as we now call it. But all aspects of the underwater world fascinate me so why not explore in this aquatic habitat as well. Growing up I had a fascination with ponds and tadpoles. I even kept aquariums filled with them in my bedroom. (until they turned to frogs and escaped, to my mothers’ chagrin). So donning dive gear and a camera and putting my head under the surface of this somewhat murky world was a natural thing for me to do. Although I did not anticipate the years of ribbing I would get from my fellow underwater photographers who kid that I only like to dive in water the depth of puddles. While I was poking along through a gap in the stalks of the Water-shield plants caused by a fallen log I glanced to my right and saw a surprising sight. What looked like a cloud of locusts was coming towards me through the water. 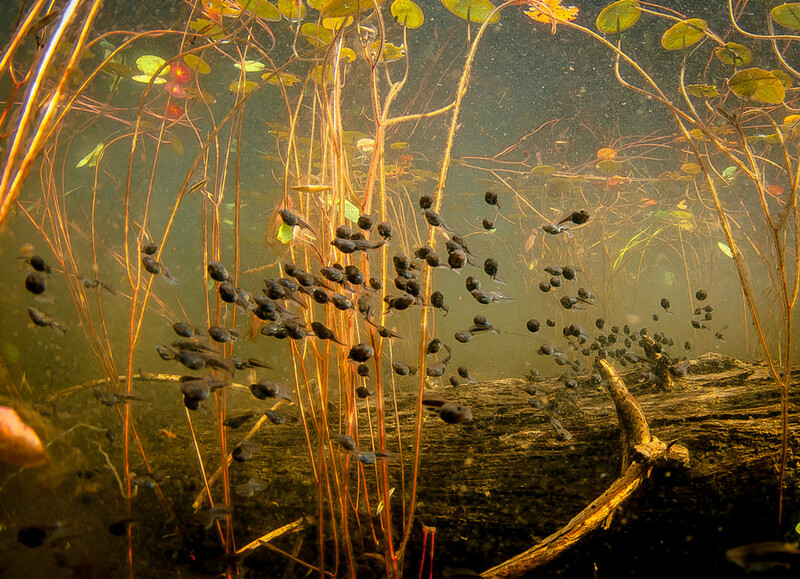 It was the beginnings of a group of tadpoles (later I learned the name “cloud” refers to such a group). The leading edge of this swarm headed right towards me and then followed the same log I was using as a pathway. I quickly got my camera into action and started shooting. Little did I know that I would take a photo that day that would jumpstart my photography career. I truly did not even know what I was witnessing. The tadpoles kept streaming past me for what seemed like five minutes, in a column that resembled an army marching into battle. Eventually ending I started following them to their destination. This turned out to be a couple of tree stumps right at the edge of the lake shore. 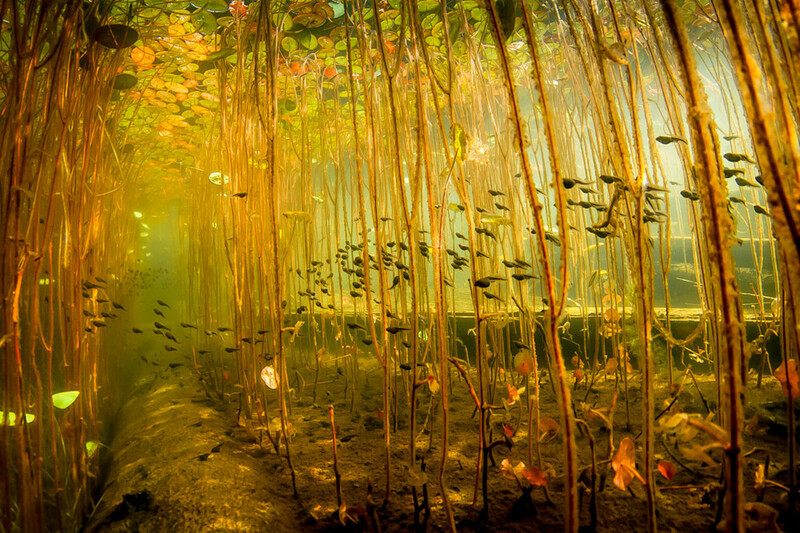 The underwater portions of the wood were covered in algae and it was this source of food that attracted the tadpoles. Later I found out that these were the tadpole stage of the Western Toad (Anaxyrus boreas). This is a boreal toad living in higher elevation forest areas. It comes down to sources of water to breed in spring. Several lakes around Campbell River and in Strathcona Park are common breeding grounds for these toads. After I looked at my finished images and started sharing them online I realized I had taken some unique pictures that day. 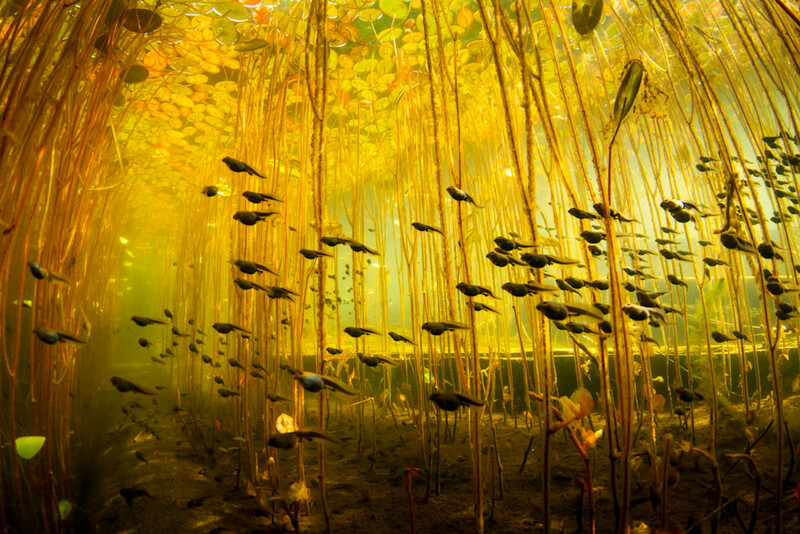 I was not able to find any underwater images showing this kind of schooling behavior of tadpoles. 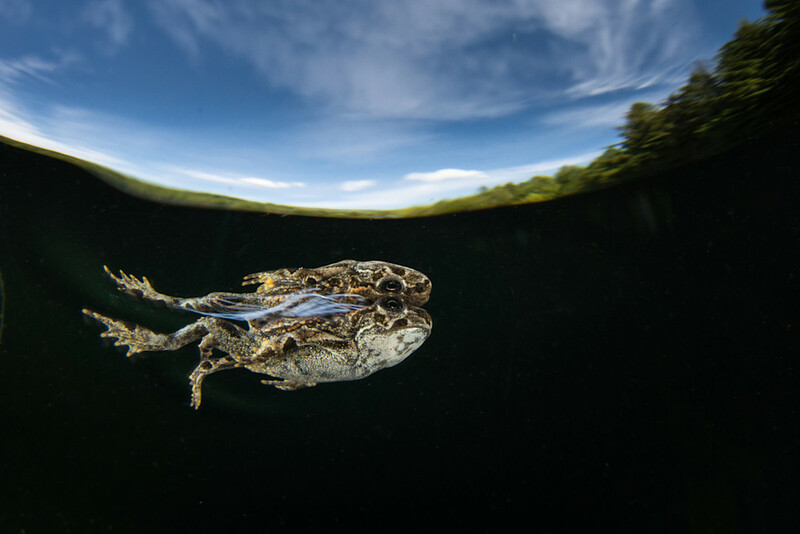 With the encouragement of a friend I submitted the image at the top of this story (called “Cloud of Tadpoles” ) to National Geographic Magazine and to my surprise and excitement they were very interested in it and immediately posted it on their website. It was then scheduled to go into the magazine in the April 2013 issue. This led to a flurry of activity that went on for years. 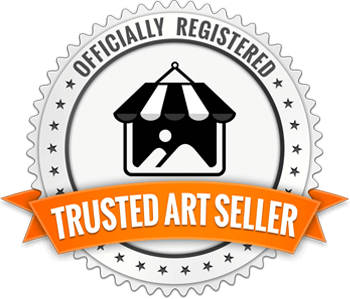 Many magazines and books have published this image and I have sold lots of prints of the same at art shows and from my website to customers around the world. 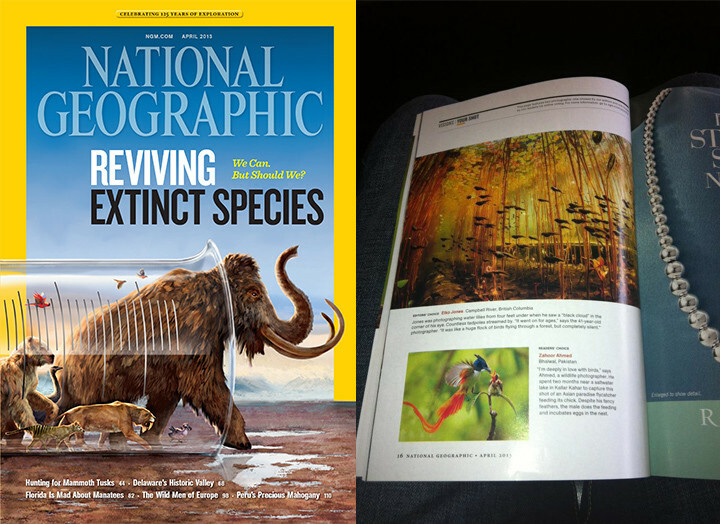 Even just now this image is garnering attention wth National Geographic. 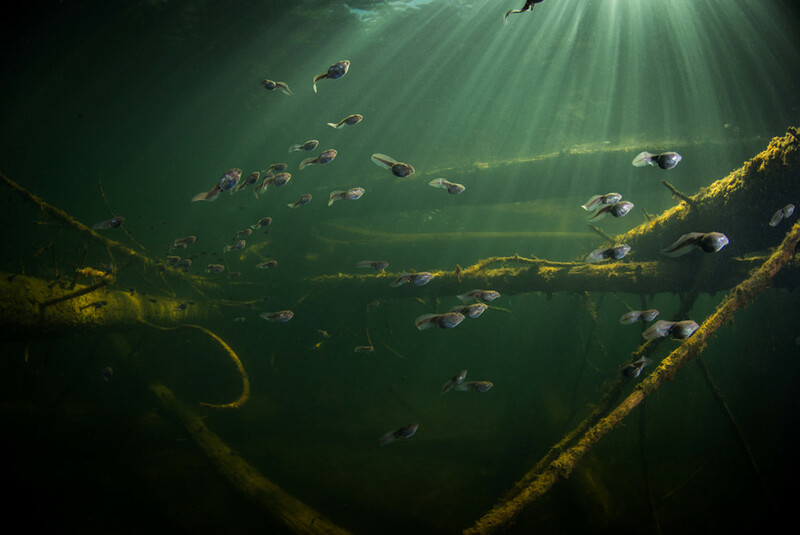 I have just signed contracts to have Cloud of Tadpoles exclusively featured as a Limited Edition print in National Geographic Fine Art Galleries. 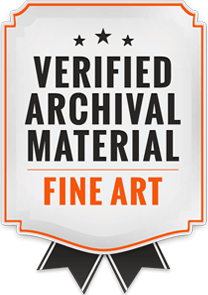 Also it is being included in the upcoming 50 Greatest Landscapes travelling exhibition by Nat Geo. It still amazes me how sliding into a swamp with my camera just to explore led to this series of events that became very significant to me as a photographer. It truly was a “Lucky Shot”. 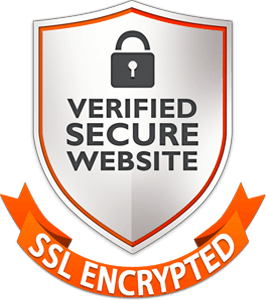 But then I have always believed luck happens when opportunity and preparedness meet. For a few years after I went on the same day in July to see if I could witness this spectacle again. I did, but never managed to take a shot quite like I did that first time.